Cyber Security is a great warfare. There is always a race here between malware developers and security vendors. And by the very nature of the security software development process, malware developers are always ahead of the security software. Present day malware have a characteristic that once they are able to enter your computer, they try to block you every mechanism, which can try to restrict their evil designs. They will try to disable your antivirus suites, they will change your browser homepages, they will try to modify your hosts file so that you are not able to access the security vendor websites and other forums, they will disable the update process of your security software and things like that. There are fair chances that if your antivirus definitions are not updated, your antivirus installation will be crippled and handicapped beside the damage to your other applications. In such a situation, you might need a security tool, which is ready to combat the malware, and is ready with the latest virus definitions. A-Squared Emergency USB Stick is one such tool. 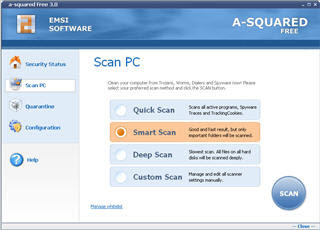 It is a free tool, which from the reputed security software vendor EMSI. It is basically a combination of two security tools. a-squared Free: With a-squared Free you have got the powerful a-squared Scanner including graphical user interface. Search the infected PC for Trojans, Spyware, Adware, Worms, Dialers, Keyloggers and other malign programs. a-squared Command line Scanner: This scanner contains the same functionality as a-squared Free but without a graphical user interface. The commandline tool is made for professional users and can be used perfectly for batch jobs. This tool is specially suited for the cases, when the GUI interface of your installed antivirus gets disabled and you cannot use it for any meaningful purpose. A command line tool is very useful in such a situation. Does this protect from autorun.inf virus in USB sticks? A-Squared seems like a very useful program in detecting infected USB connected devices. I will buy a copy of this software.